Offer lovely orioles an elegant feeding station using the Audubon Cut Glass Oriole Feeder. The tall, faceted reservoir and copper colored base bring a sophisticated look to this feeder, while offering a favorite food to your birds. 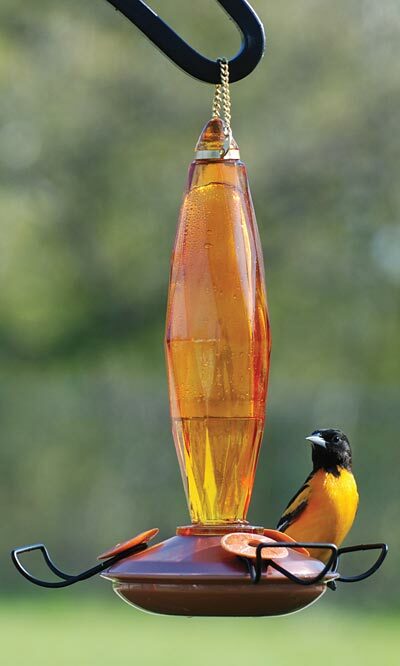 The glass column holds up to 10 ounces of oriole nectar, and its amber color aids in attracting them. The translucent glass helps feed levels stay visible, and the diamond-shaped facets on the item add a touch of style. This reservoir connects to a metal and plastic base, with three ports for plenty of feeding spots. Each port is shaped like an orange slice, for added interest, and has a perch jutting from it. The copper colored metal at the top of the saucer protects the nectar from insects, and the plastic bottom secures the item together. A permanently attached metal hanger enables this feeder to hang from any hook or bracket, within easy reach of orioles. Bring a dramatic look to your yard with this Cut Glass Oriole Feeder. Woodlink Plastic Saucer Oriole Feeder, 14 oz.